What Makes Mighty Hearts International Special? Lives are being changed. Children involved in Mighty Hearts are healthier, happier and more successful. Kids show up early for their weekly club meetings because they can't wait to start each week. There are several instances of Mighty Hearts children moving from the bottom of their school classes to the top. Medical charts record yearly health improvements in the children in the program. Graduates from the program become leaders and mentors to current children in the program. Family focus and education are essential parts of the program. Parents and guardians are educated and enabled to provide basic needs and loving environments to their children. 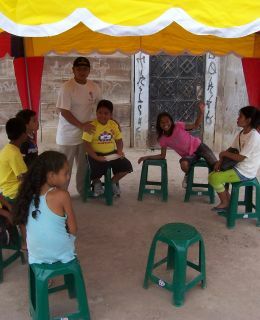 Families are often healed and restored through the child's involvement in the program. Dedicated local volunteers make all the difference. Mighty Hearts club leaders are dedicated mentors who genuinely love working with the children. Their passion is shown in the love that they show to the children and the time and energy that they pour into the program. By joining our community and sharing your personal experience and knowledge, you can help us and others in raising awareness about the children of Peru. Club Growth As Mighty Hearts expands in Peru we need to fund current and new clubs. We also need to develop leaders for the new groups. The current clubs which support more than 700 children are underfunded, and more than 2,000 children are on the waiting list. Spiritual Growth Without a biblical, spiritual foundation of saving faith, a child lives without hope. Your support helps us to tell these children that God loves them and has a purpose for their life. Education Quality education is a crucial step in providing opportunities for children. The difference between public and private education in Peru is often the difference in breaking the poverty cycle. Health and Nutrition Family incomes range from $2 to $3 a day. This makes it difficult to provide the quality of food that supports fundamental health and growth of the children. A key initiative for Mighty Hearts is education on the importance of diet and improve intake of key vitamins, iron, and fiber. Clothes and Shelter Most of the children in the program are in need of clothes, especially shoes and undergarments. In addition, some of the families do not have adequate shelters to provide protection and privacy.